The question comes from one of the few stragglers still hanging at a nearly cleared-out Union Transfer. Animal Collective has just finished a show in Philadelphia, and although the venue is just about empty, the man asking the question is in no hurry to leave. He’s standing here, but he’s clearly somewhere far, far away. But even in his scrambled state, it isn’t hard to trace this stranger’s line of thought. At 6-foot-4, 264 pounds with three-day stubble, the man seated on the bleacher behind him does look like someone. He wasn’t the only one. An hour earlier, a girl in the bleachers sits hunched over with her face in her hands, the aural onslaught disagreeing with whatever else was in her system. Animal Collective’s music tends to produce this effect; their set is an immersion into complete sensory stimulation. The smell of weed hangs in the air, and the unceasing wall of sound is coupled with an overwhelming series of visuals. A large white screen hangs on the wall behind the band, and canvas pads line the area above and below the stage. Projected onto each blank surface is an identical combination of spinning colors and shapes. “This is so weird,” Barwin says. He’s not complaining. The Eagles linebacker is perched in his usual spot at Union Transfer, in the half-dozen rows of bleachers at the back of the balcony. Tucked up here, he’s less conspicuous, but he still stands out from the crowd of thin, plaid-draped bodies. He’s wearing slim, dark jeans folded once at the bottom to reveal black leather oxfords (no socks), and a blue T-shirt featuring Keith Haring’s See No Evil. This is life for Barwin — 12 hours earlier, he was arriving at Lincoln Financial Field to play the Giants, and now he’s casually taking in some Sunday-night experimental psychedelia. The 15-7 loss earlier that afternoon dropped the Eagles to 3-5, but for the third straight week, a once-struggling defense had played well.1 Barwin has found a new home in his first season with Philadelphia, where he signed as part of the Eagles’ transition to a 3-4 defense after four years as a pass-rushing outside linebacker for the Texans. In a league where single-minded football obsession and the purposeful snuffing out of personality seems to be encouraged among players, Barwin has established himself as a unique character. From his promotion of green living and energy conservation to his public endorsement of marriage equality, he’s an individual in a profession where individualism is often demonized. Not long before Animal Collective launches into “My Girls,” their entrancing, impossibly catchy hit from 2009’s Merriweather Post Pavilion, Barwin leans over. “You know those ‘Overheard in the Crowd’ sections of concert reviews?” he asks. “That girl just said, ‘I thought they were going to play, like, songs.” He has some experience with rock criticism. During his time with the Texans, Barwin became a fixture in Houston’s arts community. He became so entrenched, he even reviewed a Fitz and the Tantrums concert for the Houston Press. Animal Collective barrel through their set without a break of more than a few seconds — across two hours, there isn’t a single instance of stage banter. After it ends, everyone still inside is gathered at the tables in the large, high-ceilinged bar just beyond the doors. Standing at one of the tables, Barwin starts a conversation with a shaggy blond-haired twentysomething swimming in red-and-black buffalo plaid. He mentions something about working at the venue. There’s a mumbled response, followed by shouts of “Yo!” The man waves his hands and yells in the direction of the security guard. He has the look of someone chemically bent toward paranoia. And although it’s unclear what has set him off, the inquisitive hulk seems to have made him nervous. Barwin starts to move toward the door. He doesn’t know what’s happening, but he can sense it’s not good. There are the moments when stepping between worlds means being an intruder in both. The night before the show, Barwin is asleep at the team hotel while a group of family and friends gathers for dinner at Prime Stache, a restaurant in Old City owned by Eagles tight end Brent Celek. Barwin’s parents are up from Sarasota, where his father is the city manager, and this weekend two of his three brothers have also made it to town. Connor is the youngest of the four Barwin boys, all raised in Hazel Park, Michigan, just north of Detroit. He has one tattoo, of the Detroit skyline on the inside of his right biceps. Their father was the city manager in Hazel Park for years, and that meant the Barwins called the working-class town of about 16,000 home. Their house, just south of 10 Mile Road, was in an area colloquially called Tool Town, and many of their neighbors made a living at the job shops nearby. In the summer the walls would shake from the morning rumblings of the stamping plant, and on clear afternoons the galloping from the racetrack down the street would carry to their front porch. Tom Barwin describes his city manager duties as those of a school administrator, but for an entire town. He’d met Connor’s mother, Margaret Bailey, while they were both working on a campaign — small-town politics were an ever-present topic at the dinner table. Tom espoused the importance of smart city growth, decrying Detroit’s problems since tearing out the “backbone” of its local transit system. “My dad was talking about how we were going to run out of gas when we were kids,” Connor says. Those dinners informed the unofficial Barwin family mantra: balance. Each son was required to learn an instrument and take piano lessons. Sports were just a part of the pursuit for well-rounded men, and Connor’s first love was basketball. By the start of middle school, he was already tall, slender, and talented. When he was in eighth grade, a girl named Laura from a nearby town was coaxed into a double date when she heard he could dunk. Twelve years later, they’re moving into a house together. Basketball was yet another way for Connor’s parents to widen his view of the world. When he was 11, the basketball team coached by his father traveled to urban Detroit to play a squad made up of students from a local outreach program. The game was a blowout, and afterward, the coach who ran the center asked Tom if his best player had any interest in coming down and joining their team. Soon, Connor was spending his afternoons at St. Rita’s Church, just south of 7 Mile Road. Connor says his mother was the one who encouraged him to start playing at St. Rita’s. The trips across 8 Mile Road were a chance for Connor to learn the realities of life in a different part of Detroit. Every now and then, he and his father would show up and find the gym closed. Tom would ask someone hanging around if they knew why. “Another funeral,” someone would tell Tom. Around that time, the Barwins were growing concerned about Connor?s older brother Joe. He was 16 and spending much of his time locked in his room. Both Joe’s parents and brothers suspected they knew what was wrong — that Joe may be gay and was struggling with his decision to come out. The Barwins got some help in March 1998, when Tom was hired as the city manager of nearby Ferndale. “It was kind of the gay mecca of metro Detroit,” Tom says. “That was just damn good luck. Through my contacts there, they just said, ‘If your son is gay, you have to let him come out, and you just have to be supportive. '” Eventually, it was the Barwins’ oldest son Sean who asked his brother the question. After coming out to his family and friends, Joe’s mood improved. He stopped locking himself in his room. The depression dissipated. For Connor, it was another experience that deepened his worldview. “He was able to see all those dynamics, and really, some of the deep, personal implications for the individual,” Tom says. 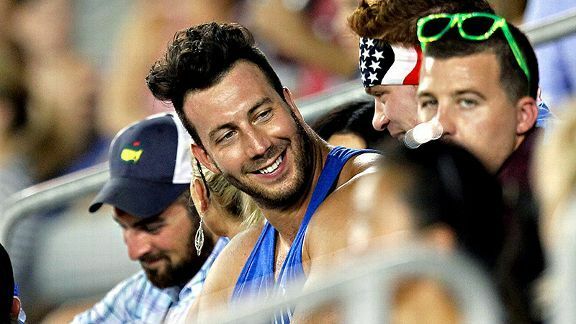 Barwin was mostly quiet about his stance on marriage equality and gay rights early in his career. Young players are faced with enough challenges; ostracism for being vocal about a potentially divisive political issue didn’t need to be another, he thought. But over time, as Barwin gained a foothold in the league, he became comfortable telling teammates — and especially teammates who were friends — that his brother was gay, and that he objected to the use of gay slurs. “I would just explain how ignorant it made them look,” Barwin says. On a serious note, I stand by Obama on marriage equality! I believe ALL families deserve the same rights. It’s the type of choice Barwin likely wouldn’t have made early in his career, but his standing as a respected NFL veteran was only part of the decision. Barwin says that like in much of the country, ideas about homosexuality have progressed in NFL locker rooms. And despite debates about bullying behind closed doors, he says slurs have become more rare. He also says that he was never asked by the Texans to be less vocal about his views. Most of the criticism about his willingness to share his off-the-field life came from fans during last season. During his hurried exit out of Union Transfer, Barwin grabs a flyer advertising the venue’s calendar of events. As the taxi pulls away, he’s already telling Laura which bands they need to catch next month. “Polica, and then Sleigh Bells,” he says. Barwin’s love affair with indie has been a relatively recent development. His mandatory time playing an instrument was spent on the drums — “I was never very good” — but in high school, his music collection consisted mostly of hip-hop. 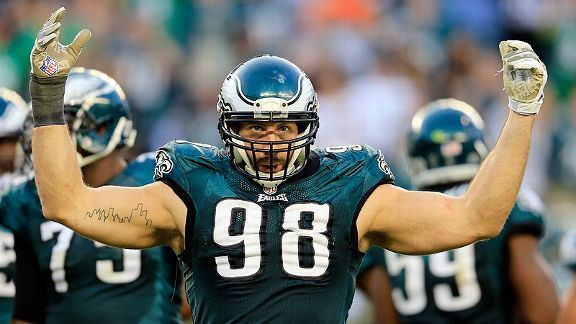 “I had every Bone Thugs-n-Harmony CD,” Barwin says. In the first game of his second season, Barwin suffered a devastating ankle injury. Placed on IR shortly after, he spent most of his days in the training room. That’s where he met Pat McGinn. McGinn, now 28, arrived in Houston as an intern trainer the same year Barwin arrived as a second-round pick. As Barwin received his daily treatment, McGinn would talk about his nights in Houston, scraping by thanks to a familiarity with the city’s best drink deals. Eventually, Barwin asked if he could tag along. “Hanging out with a bunch of schmucks trying to get by on dollar-beer night probably made him feel like he did while he was growing up,” McGinn says. Debauched nights with rock stars make for good stories, but most of Barwin’s time in Houston was spent quietly immersing himself in every part of the city’s culture. He and Texans nose tackle Shaun Cody frequented local restaurants, getting to know chefs as they ate their way through the city. When Barwin was looking for an original piece of art for his apartment, he took to Twitter and found a local Houston artist to paint a mural. “He had to make an effort to delve into the underbelly of a city,” McGinn says, “and when he left, there were people who were devastated.” Soon after Barwin signed with the Eagles, McGinn saw the lead singer of local band the Tontons at a party. She’d heard the news, and when the conversation turned to Barwin, her eyes welled up. On Monday morning, Barwin heads to a popular coffee shop near Rittenhouse Square in central Philadelphia. This is his routine the day after a game: a cup of coffee and a chocolate croissant. He’s still finding his niche in Philadelphia. He isn’t intimate with the city yet, but his life here has mostly been a continuation of his time in Houston. He bought a car — the all-electric Tesla Model S, of course — but his social-media presence is still littered with photos of him chaining up his bike and riding the bus. By the time his coffee is finished, it’s after eleven. “You hungry?” Barwin says. “We were going to go get pizza.” Lunch is waiting in Love Park, named for the iconic sculpture at its center. It’s a food truck called Pitruco that serves wood-fired pizza, and on the walk, Barwin reels off the backstory. “It was started by these two guys who went to Harvard,” he says. Before opening the truck, one worked in finance, the other as a developmental psychologist, and they claim to have figured out the perfect recipe for crust. Barwin’s informational tour extends to the city’s architecture. He points out the statue of William Penn atop City Hall, and that Philadelphia’s lack of skyscrapers stems from an old agreement stating that no structure would be built above Penn’s height. The crust may not be perfect, but it’s close. The food doesn’t last long. Soon, Laura arrives on her bike, and after another pizza disappears, the conversation turns to the afternoon’s plans. Hanging above the table is a collection of banners for local attractions, and she mentions that they’ve been wanting to visit the Barnes Foundation, an art museum consisting entirely of one Pennsylvanian’s personal collection. Once inside, the tour starts with a short biography of founder Dr. Albert C. Barnes. Born in Philadelphia to a working-class family, the self-made millionaire spent a portion of his fortune on a handful of modern paintings. But when they eventually arrived, there was a problem. Barnes failed to grasp what distinguished these Renoirs and Picassos from anything else. He obsessed over the idea — purchasing more paintings, soliciting the help of experts. Over time, his appreciation for the form — and his collection — grew as he developed the notion that art was the ideal way to enlighten the common man. What sets the Barnes collection apart is not the quality of the pieces. There are Cézannes, Van Goghs, and Seurats, but the defining characteristic of the museum is its layout. The paintings are organized and stacked on the wall in a manner that might otherwise seem gauche. But somehow, it works. In one room, Renoir’s Mother and Child sits at the center of a perfectly symmetrical grouping. Forest landscapes flank it on both sides, and images of fruit and subjects in hats mirror each other. Folded onto a bench in the middle of the room, an audio guide playing through his headphones, Barwin raises his arm and moves his hand in a straight line along the arrangement. The focus of the next room is Modigliani’s Girl With a Polka-Dot Blouse. The subject’s eyes are a pale, chillingly calm blue. On either side is a painting by Chaim Soutine. There is something dark, violent, twisted about these paintings. Seated before the painting are three elderly women, each barely more than 5 feet tall. Towering behind them is Barwin — the muscles in his back bulging through a Dri-FIT pullover — looking into the eyes of Modigliani’s girl. Through his headphones, the narrator describes the painting. The calm is offset by the violence, she says. Only because the parts are dissimilar does the whole become something more. Three weeks later, the Eagles have won three straight games and lead the NFC East. On Sunday’s win over the Redskins, Barwin delivered a crucial strip-sack of Robert Griffin III.